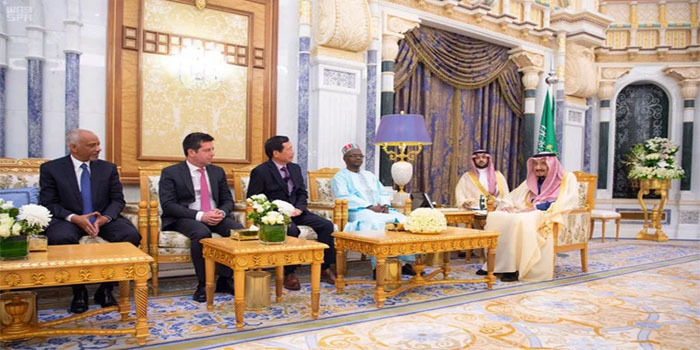 A number of ambassadors of brotherly countries called on King Salman at Al-Yamamah Palace on Sunday and presented their credentials to the king. The ambassadors included Dr. Ibrahim Gallo (Sierra Leone), Vu Viet Dung (Vietnam), Vakhtang Jaoshvili (Georgia), Faisal Fakir Kassem (Mozambique), Georg Postinger (Austria), Raja Ali Ejaz (Pakistan), Abdulazim Mohammed Al-Karuri (Sudan), Sheikh Ali bin Khalid Al-Jaber Al-Sabah (Kuwait), Peter Nicholas (Kenya), Mohamed Amin Ould Cheikh (Mauritania), Zacaria Fadl Ktr (Chad), Marcelo Souza Della Nina (Brazil) and Dimitar Ivanov Abadiev (Bulgaria). The envoys thanked the king for the hospitality and warm welcome accorded to them. They also conveyed greetings from their respective leaders. The ceremony was attended by Interior Minister Prince Abdul Aziz bin Saud bin Naif, Foreign Minister Dr. Ibrahim Al-Assaf, Minister of State Dr. Musaed Al-Aiban and other top officials.